GrateTV tried our hand at what we call taffy for grown ups this week. 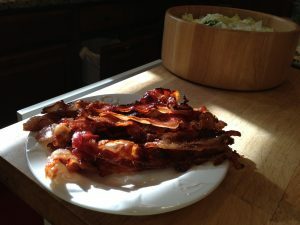 It’s a salty savory sweet and spicy treat we call Pig Candy. This week we dub it “Porky Pig Candy” as we continue to plan the menu for our Labor Day Loony Toons Extreme BBQ. Pig candy is super easy to make you just need to watch it in the over or grill because the sugars are quick to go from caramel to burnt! 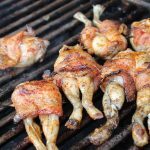 Frog legs are usually served fried but since we’re all about the ‘que we tried to fire things up on a gas grill. 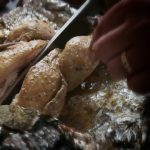 It this week’s show Chef Paul Stewart from the Palmetto Bay Sunrise Cafe shows us his method of wrapping the meaty stems with a strip of bacon and what he calls “Stu Spice”. See more GrateTV podcasts at http://GrateTV.com. 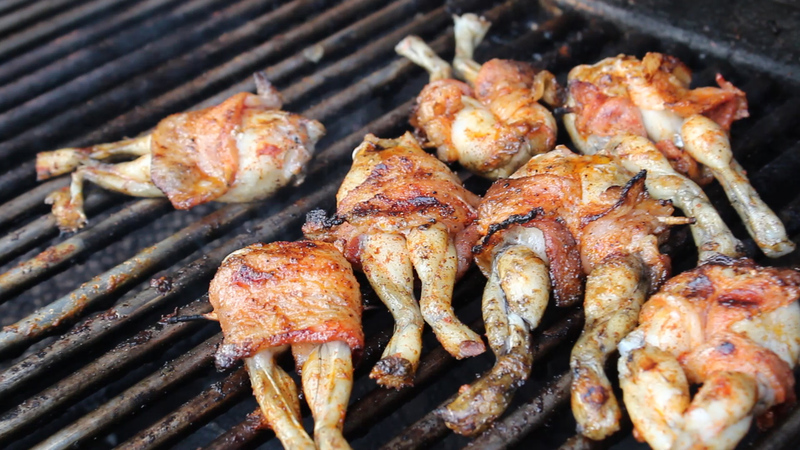 Got a favorite way to do frog legs? Let us know in comments. 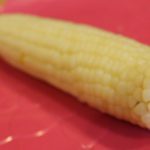 Corn on the cob can be a hassle to get clean and free from silks. Here’s a quick trick to get each cob super clean and – since this is Barbecue Tricks it’s nice to free up the grill for the meat! Take a look. Use a sharp knive and chop the bottom – rounded ends off each cob. Keep on the husk and all. Then give each cob… husk, silks and all a 4 minute zap in the microwave. Add four minutes for each additional cob. After heating you should be able to slowly (carefully with gloves – it’s HOT) squeeze out the cob. 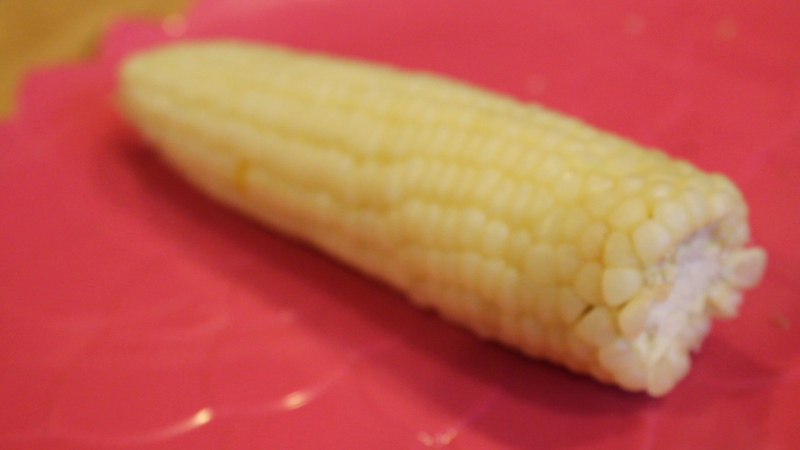 Take a look at the two minute corn husk shucking video to see it in action. Here’s a dramatic way to present BBQ chicken that bakes in all the flavor and adds a fun exclamation point to the start of the meal. Imagine presenting a guest with a clay sculpture of the chicken he or she is about to eat. 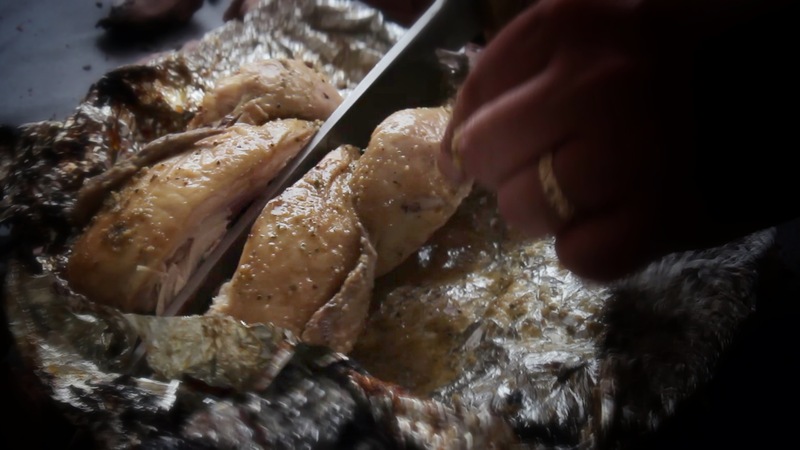 They bust it open and have a succulent chicken ready to eat. Super fun. Jack Waiboer and GrateTV took a look at this technique done up with a flourish at the 2012 Bovinova in Greer, SC. Also inspired by a Saveur article we dug up here. GrateTV is our weekly BBQ and Grill show hosted by Jack Waiboer from http://carolinapitmasters.com and Barbecue Tricks founder Bill West.